As for the map, backdoor naturals aren't a particularly loved map feature, especially when there's so much available airspace for drops and harassment (which can cause balance problems too). 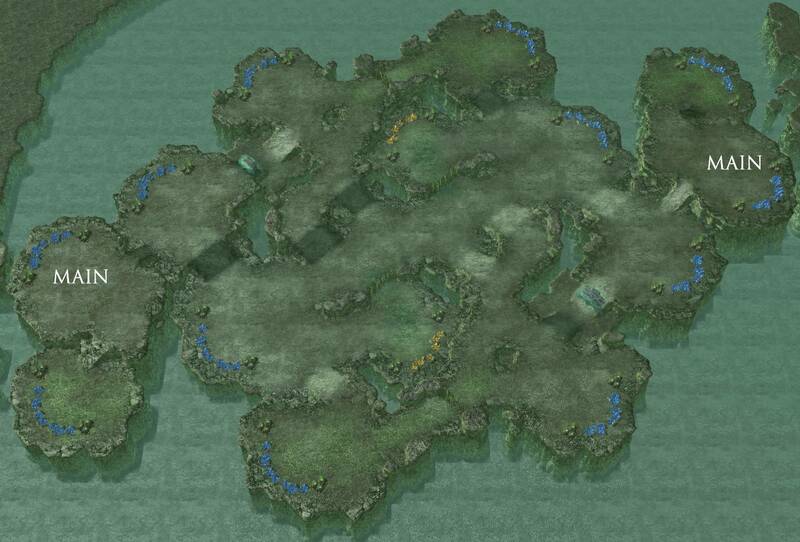 Drops and liberators are made that much stronger by the fact that the map is quite choked up--apart from the narrow passages on the top and bottom of the map, there's only the middle choke that has to be controlled to prevent ground units from crossing over to the other side of the map. And could you post a 90 degree overview of the map? Angled images sometimes make it hard to figure out proportions. So I think getting rid of the backdoor and in return making the natural easier to hold. Then work on squaring up the map so that there is less air space. The middle of the map is actually the part that I've changed the most, but when I test vs the computer it does make for some interesting engagements. I guess the only thing I set out to do was make an "epic" or grand style map, so maybe I made it too sprawling. Looking for some last feedback, please post potential annoying player strategies or imbalanced things. Need some feedback again, anything game breaking or annoying play potential for players? Also I am struggling to find the proper textures to use, I want a really lush-overgrown-rugged mountain jungle look. Can someone link me to another map that pulls off something similar? * Too much airspace around the edge of the map--the defensive watchtower in the main against drops is fine I guess, but the fact that your map needs it is a bit of an orange flag. * The destructible gate thing clashes with the texture set. Just regular destructible rocks would be better there. * The high ground overlooking the base across from the main is problematic. If it's droppable it's a big balance problem and makes that base essentially unholdable in some match-ups. If it's not droppable it still makes liberators better and is somewhat of a problem. I'm not sure what the benefits of having it there are. * The double ramp to the 11/5 o'clock base takes a lot of space and I'm not sure what the benefits of it are. 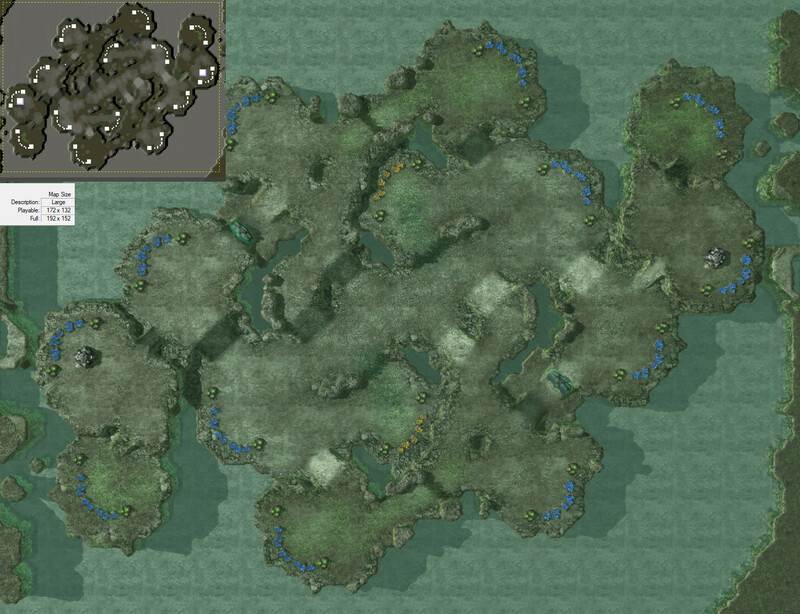 As for inspiration for textures, I'm not sure what you're looking for, but there's probably some map with a similar look in this list from the last TLMC: https://www.teamliquid.net/forum/starcraft-2/534744-team-liquid-map-contest-11?page=4#61. Thank you for the feedback, it helps a bunch, I was just about to go to town on texturing / doodads. There will be a large amount of airblockers to protect the main base, but noted. I will try and make this closer. Good call, it was just a remnant from the 40 prototype versions that got to this current one. This was the last section I made... I will make a canyon instead, but its probably the weakest section of the map despite the LoS blockers angle. Having a double ramp (it will be a curved staircase,) was something I wanted to do from the getgo, its something like an island base but still connected. Meaning if there is any defenses up there it will be really hard to ascend the curved staircase. The wasted space is not the best, but I still think its ok. Terran can float a main CC to that location and PF it very easy, which is something I think is cool. I will take your feedback and alter the map before I post it as a new map, so thank you. FYI air blockers are really buggy and can easily trap units, so in general I'd recommend using them as little as possible. Its been years since ive made a map, are they not used anymore? I was sort of needing them for the map... Like the cornerstone of the map lol. Can I edit the yellow dotted line for playable zone? They are still used occasionally. The current ladder map Stasis uses them pretty extensively. They're still buggy there, but sometimes the needs of the map outweight the downside of having to use them. Gotcha. I think? I'm fine since they wont affect any main path. Ill practice on Stasis and see how buggy the blockers are. Post Screenshots of your WIP Melee Map! Many mapthreads are the only public appearance of a map and almost as often maps are posted and severely changed afterwards. There is nothing wrong with that, but why not post the WIP maps in a WIP thread and give the map its own thread once you think it is really final? We are here to share our ideas. We are intersted in what others are producing. We want to discuss map making and support each other make better maps. This thread is meant for all things WIP, so post screenshots of melee maps: general concepts, details like a backdoor or a very specific placement of a watchtower, but also map art ideas as well as nice tilesets or even custom texture sets. Don't be shy! Chances are that there are other map makers who can help you out as well as other people who are interested in your work and like to comment on stuff. Sharing your ideas and discussing them will help you become a better map maker! I cannot make rules - but i would really like to see comments that respect someone's work but really manage to be very concret and precise in their critique in case that someone is really bothered by some map "feature" . Also if you like something, try to explain what it is that you like and why! It will help the author produce even better stuff in the future! Use spoilers when you post more than a few images! I was away from map making and sc2 for some time. Some things evolved and changed, other remained the same. I am unsure if this is a slump or a general decline, but i feel like custom melee maps are on the wrong track really. The game changed in some aspects, but map making did not make any bigger steps forward. And you cannot only blame tournament makers. There actually are very few good maps. Maybe there actually is an overproduction, but in general I feel like there is too few honest critique among "map makers" - and a lack of communication with "players" (which is nothing new). Part of this - in my humble opinion - is that people present their maps in highly standartized map threads and often people do not share their ideas before they feel a map is "complete". Hence map makers put a lot of work into something that just does not work in one way or the other. Once their map gets the needed exposure, nobody feels like commenting on it as it seems too finished already, the author is too proud of the work - but also for selfish reasons, like keeping one's ideas on a map feature for oneself. Maybe this thread fails. Maybe you are intersted to get it running and help others to produce better maps! I love how this map has developed. It is coming along nicely. The main thing I don't like now is that the third is harder to take than the fourth. Imo that isn't a very good mechanic because the player who gets ahead by taking the third can get even more ahead with the easy fourth; obviously not a huge affect for PvZ, but it does in PvT and mirror MUs. I'd like the fourth to be harder to defend somehow- even something as simple as making the cliff more accessible (closer air distance to the opponent makes drops easier). Or something like making the ground distance farther. Coppermantis: My biggest gripe is that the space allocation is a bit off. Firstly, the third has a ton of space between where you expand and where you wall- which is between the 1x and 2x ramp for PvZ. You could decrease the size of that whole area by quite a bit and put the space in somewhere that it needs to be like the small middle. I'm not a big fan of the free fourth, but it seems alright. Changing it would make the fifths really difficult. However attacking into the fourth or third seems nearly impossible with the ramp setup. I think the ramps to the middle should be more plentiful. RFDaemoniac: There are some incredible ideas in this map. The center bases are basically impossible to take, and for that matter, anything past four bases (expanding to the corner and the third against the main) is just about impossible for ZvX. I don't see any easy solution except just simply making the map larger. I think it would be cool if you stretched the center of the map by 12 or more hexes vertically. Try to keep most of the distances the same except make the center bases as far apart by ground as possible so they're more viable. 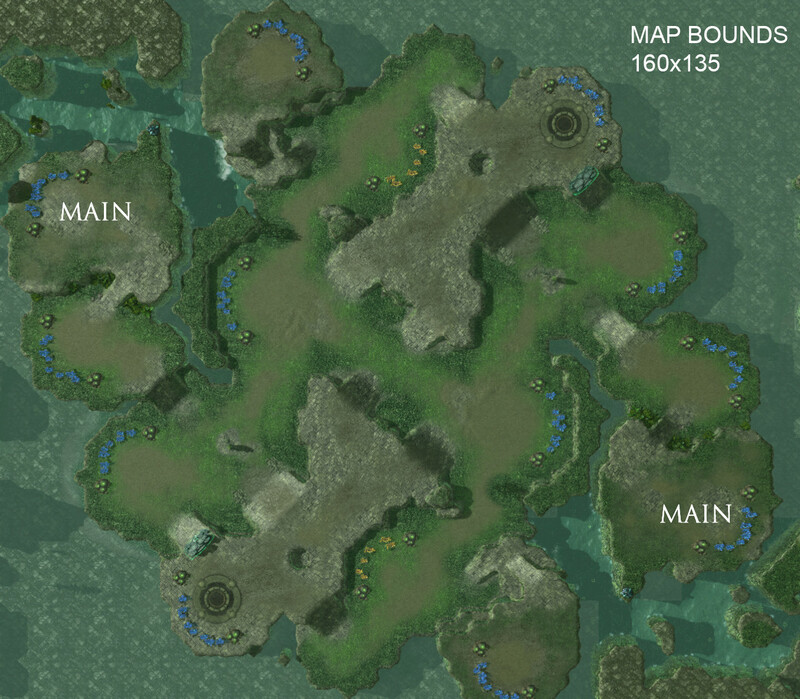 That, or you could try adding islands so that zerg could get past fourth bases. Getting back into mapping after a long hiatus. I dusted off some old idea I had and have been trying to update it to more modern standards. The inspiration was to do an up to date competitive version of Scrap Station. I would appreciate some feedback. Well first of all I have some doubts that anyone could make a good up to date competitive version of Scrap Station--the close by air distances are just fundamentally problematic (using Renegade Missile Turrets, Air Blockers or Inhibitor Zones to solve this is perhaps possible, but they all bring their own problems). But let's put that aside. The naturals have a few issues. The rush distances between them are too short I think (generally you want 30+ seconds from nat to nat), and the ramp to the natural is pretty far from the townhall which makes walling off difficult (especially for zerg). Also I think you can't do a standard 3 building + 1 unit gap wall-off on it. Even more importantly the natural has three different openings (including a high ground opening) which makes it basically impossible to defend in some match-ups. Beyond that it's hard to see what expansion pattern players can follow--getting a fourth is pretty awkward here. The base immediately between both mains can't be held by either player, and there isn't really much of a point in having three side by side golds. Thank you for the reply. Those are definitely concerns and they are things I have thought about. I would like to discuss it further if you don't mind and give you some more details to see if we can get to workable solutions. I am very much trying to push the envelope here. I agree lets set the short air rush distance aside for the moment. The proportions of the map can be hard to read from the overview so so let me give you the numbers. Natural to Natutural (town hall to town hall) is 47 seconds. Top of ramp to top of ramp is 36 seconds. I understand that it is a little more open in the natural than is usual but this was on purpose to allow for easier defense in terms of not ending up in chokes yourself as a defender. How about this change where I move one of the extractors to the other side and push the natural up a bit? 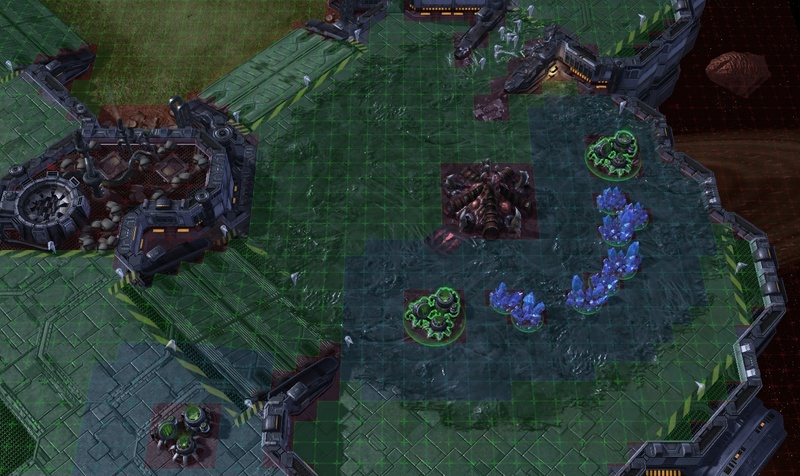 Here is a Protoss three building and one gap walloff. This is unaltered from the original version you saw. The feedback that getting a fourth is awkward is something to consider. I agree that the base between the mains as a fourth is tough. Perhaps a terran could do a mech build to hold the center, MAYBE. But it is meant as more of a late game base to take. So that leaves the two bases more toward the middle of the map. Now, I have another version that has a ramp leading down from the third into the immediate fourth with a rock wall-off but that adds yet more rocks and another entrance into the third/natural that is not a long way around. I mean a fourth is not free here and that is a bit intended. You have to fight for map control after three bases. This is to avoid turtle games as the nature of this map is prone to. Here is what I think is a reasonable way to achieve a fourth base. Bring your army a bit forward and defend these two attack paths. Additionally, there is the island base for an alternate strategy. This also brings us to the backdoors on the long way around the map which is also intended to avoid turtle games. It is quite a long way to get to those. If you bring your whole army you are going to be very out of position to defend your own bases and you will be prone to counterattacks. I envision small hit squads using those paths for attacking and I think it could be defendable. But, too many openings is a concern. The three gold bases at the end of the map is a new feature I added. Part of the challenge here is to incentive players to utilize the whole map since they both start concentrated on one side. The center gold base takes its cue from Scrap Station obviously. It is a full base in terms of total resources. It has the same total resources as a regular base. The other two only have total resources equal to a half base. In terms of total resources those bases only represent 2 bases. I believe that you should be richly rewarded for being able to hold that side of the map. Anyway, if you have further thoughts given this new information I would appreciate hearing them. What are the dimensions of the map given that nat. to nat. is 47 seconds? 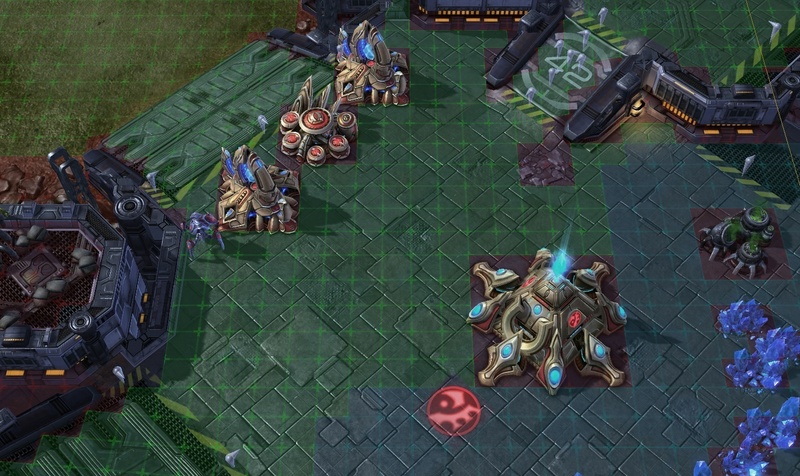 The Protoss wall-off is fine then, though I don't think zerg can wall-off even in the updated image. I don't think the base in the middle works even as a late game base--bases right in the middle tend to never be taken (unless a player has an advantage so overwhelming that they've already basically won the game). The natural is still the biggest concern. Even with very long rush distances backdoors make things very hard to hold especially when the openings are so distant from one another and the town hall. Even the mere fact that the natural is so sprawling make it very vulnerable to drops or nydus play. Islands tend to never be taken (Ulrena and New Gettysburg come to mind), and far golds are kinda iffy (on Dreamcatcher they were occasionally used mostly by Protoss to power some large gateway timings), but those are mostly academic questions when you have a natural this vulnerable. But what about GOLD ISLANDS? 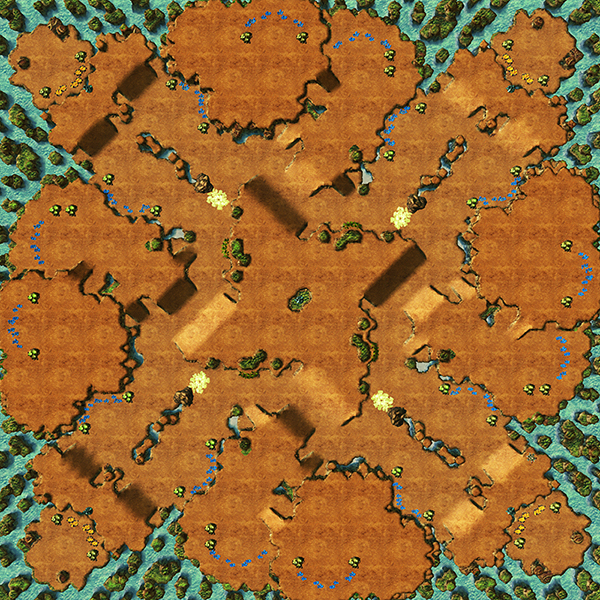 154 x 154, 20 bases... 5 watchtowers that spot the centre and the islands/corner drop angles. They can't see into the mains or naturals of course. Centre watchtower being on low-ground is mostly just flair, but I was also interested in trying to give something to Reapers past early game? Both potential thirds are equidistant from the entire natural area, b/c of the symmetry your fourths are then exposed to a droppable cliff if you expand away from your opponent. Generally, there's always at least 2 real options for expansion direction. Those are some really, really far looking thirds Syphon. Layout seems cool otherwise but cramped. I'm not sure that this is the kind of map that works better in 4p, maybe a 2p version would be workable? You can connect creep with either third with three tumors. Is that too far? I just checked port aleksander to compare, and it seems like its two tumors for one of the thirds, and three for the other. I think its worth pointing out that the wall for the natural is behind where the 3 different ramps split off, so I could also feasibly just pull the ramp back to make the direct path to the thirds larger. There's a bit of room to open it up to be less cramped, but the centre is already pretty open. I really think it only works as a 4p map... Kind of made this in response to their absence. ranged libs could also be annoying at that natural. also with the base right against against the main because it's 2 levels down it might hide the minerals near the east spawn so be aware of that. Another thing is that it's recommended that zerg should be able to wall the natural expansion. edit. also that center looks super open and the ramps looks gigantic. cutting some stuff back might make it less choked in other areas. Syphon, this sounds like a pain, but what if you rotated the map 90 degrees (you'd have to remake the whole thing) to better utilize some of the deadspace that the layout creates? It would also involve getting rid of the islands in their current locations. I think you have a good concept with the parallel thirds, but the current problems with the layout seem nearly unfixable to me given how cramped the area you're working with is. But... There's other maps that you need 3 to get to the natural. One of them is siegable, the other isn't. Not a big deal, plenty of maps have that from such a position. As for drops... The bases wrap around the main and natural, and the corners are completely covered by watch towers. I think this is easier to spot drops on than any present map. The minerals are visible in all positions. Why is it so bad if its very open in some places and rather chokey in others? @Monitor you mean 45, right? 90 degree would be the same map :p I don't know if the geometry works out, but I can look into it. I didn't plan this extensively before drawing it up.